Releases in the Lomax/Rounder Collection are starting to drop from the skies like ripe fruit on a windy day. If Brown Girl is one of the choicest plums, it is also a surprising heavyweight. I entered this magic circle of Caribbean singing games and was instantly enchanted. I crawled out seventy eight minutes and sixty two tracks later feeling like the victim of an altercation with Frank Bruno. That is not a recommendation against buying, simply a suggestion that readers feeling their years should absorb these pastimes in manageable portions. In fact the disc lends itself to such treatment, being split segmentally into geographic regions. 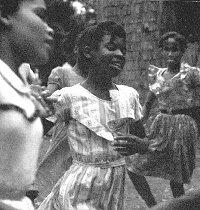 The recordings, as Bess Lomax Hawes' introduction tells us, come from a 1962 field trip, the inspiration for which was a vision of Caribbean unity. The argument ran that the common experience of conquest and Creolisation had given the various societies of the Caribbean a single cultural identity. It would be a logical step therefore to unite the region into a single Federation of the West Indies. Tangible proof of that identity, in the form of a unified folklore, would go a long way towards taking that step. It is a noble idea and it echoes similar cries for cultural unity around the globe, but I don't hear it in the music or read it in the history. A whole range of variables, including ethnic mix, attitudes of slave owners, rates of slave importations, and plantation sizes led to the concomitant range of cultures and folk traditions which is the modern West Indies. By the way, Ms Hawes seems to think that the local Indian tribes were part of this heterogeneous mix - in fact disease and slaughter wiped them out at a very early stage of European settlement. Brown Girl is part of a projected sub-series of the Lomax Collection, which will survey the musical traditions and cultures of the West Indies in considerable depth. At the back of that series is around one hundred hours of field recordings which Lomax made during that trip. It is important therefore not to take this one disc too much out of context. However, the regions represented here are all from the Western Caribbean. 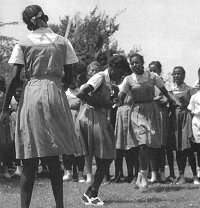 It is therefore only a partial geographic sample of West Indian singing games, and one skewed entirely towards the black communities. Yet even such a limited scope shows huge diversities of background. There are sounds so African they might never have crossed the Atlantic, and melodies which seem never to have left Europe. Some of the games are indigenous to the West Indies, many others have a wider currency. Not surprisingly, several turn up on the Saydisc CD. For example, a Huddersfield lady who steals from a cobbler is caught bang to rights when she crosses to the Caribbean. There she gets her hand firmly in the cookie jar. Ethnic origins are only partly responsible for the varied sources of this material. The folklore of children everywhere is a mess of plagiarism and re-creation and they will plunder whatever comes to hand; the folklore of adults and of other children, and material from the mass media. The process is two way, for the mass media has found both the Caribbean and children's games to be fruitful sources of novelty songs. A couple of source items crop up here. Brown Girl in the Ring is the prototype for the Boney M record and we encounter a hit from an earlier era, One Finger, One Thumb Keep Moving. To underline the folk process, however, it has been spliced with a monologue from an English mumming play. Personally, I see nothing wrong with celebrating diversity, especially when it results in such a kaleidoscope of sound. Indeed, the melange is such that I would defy anyone not to play the 'I know where that one comes from' game, and not always with any great certainty. If I hear an echo of Paper of Pins in one of these tracks, I confess it is a very faint one. There is a more obvious link however, between the game song Coming down With a Bunch of Roses and the sea shanty Blood Red Roses. I have long nursed a hunch that the nineteenth century resurgence of work songs at sea began with the recruitment of black seamen who had grown up singing work songs on land. Alan Lomax points out that, in the West Indies, as in Africa, song and music intertwined with every phase and pattern of human life. It informed the world of work, it informed the world of ritual and it was there in those intermingled provinces of children, play and education. Folklorists have paid close attention to children's games, since the days when they scrutinised everything they regarded as rude and archaic, for evidence of savage survivals. There has been much less attention from sociologists. I'd guess though that the singing game is important in terms of teaching social skills to children, of moulding them as social group members, and of developing childish imagination; of preparing them for the world of adulthood in fact. That presumably is why Caribbean adults teach their children how the games should be played. J D Elder, who shared that vision of a unified Caribbean and who assisted Lomax on the Trinidad and Tobago leg of the recording trip, recalls that West Indian children were introduced early to the world of work. Like the singing game, work was a key to integration with adult society. It was part of the process by which children learned and understood the world around them. For black West Indians formal education frequently mattered less than its informal equivalent. Children were ingratiated into the ways of social behaviour by adult example and by the rote of the singing game. In so-called advanced societies, the division of labour divorces children from the adult world, while formal schooling replaces the need for children to learn from their parents, and from taking part in singing games. Several groups of adults sing on this disc and the notes are unclear whether these are re-enactments for the folklorist, or valid expressions of adult entertainment. I'd like to think the latter and the disc offers a small substantiation, for two of these games are played during wake vigils for the dead. The tradition of game playing at Irish wakes is well documented, but I do not recall coming across the practice elsewhere. The custom could have been picked up from Irish immigrants, but I'd think it far more likely to be a continuation of African funerary practice. As with others in the Collection, the booklet contains detailed transcriptions with appropriate translations. It is a pity that CD limitations couldn't have facilitated more detailed descriptions of the games. However, these can be found in a companion published by Pantheon Books. I'm like a kid at Christmas over the entire Lomax/Rounder Collection. Many good things have hit the record racks already, many more will come. Suitable doses notwithstanding though, I doubt that any future issue will beguile the senses quite as much as this one. I have held a fondness for the Saydisc since it first appeared in 1983. Middle age and misanthropy advance hand in hand, but I remain charmed by its eloquence, and by memories of life before childhood innocence turned into misspent youth. Viewed with a critical eye though, I cannot say it has stood the test of time all that well. The recordings cover a wider period than Brown Girl, 1960 to 1982, but seem more firmly wedged in a timewarp. Partly, that reflects the tradition, or rather how I'm inclined to view it. I'll happily believe that Caribbean children act out the same games their parents and grandparents sang into the collector's mic all those years ago. However, as the biggest pessimist since Victor Meldrew, perhaps I can be forgiven for thinking equivalent traditions nearer home are buried under an avalanche of cyberspace and Spice Girls. Unfortunately, this record does nothing to enlighten me, for nothing has been changed to bring it up to date; not the photographs, not the notes, not the recordings. The playing time, by LP standards, was extremely generous but, if anything was left on the cutting room floor, why not include it now? The documentation, like the recordings and photographs, was the work of the late Father Damian Webb, a veteran collector of children's folklore. On this showing his enthusiasm for the material outstripped his ability to appraise it. The information is sketchy and full of unsubstantiated statements like "Welsh and Irish language versions of English games are the result of adult translations". Surely, in bilingual cultures, children do not need adults to convert a game from one language to another. Fr Webb seems to have thought otherwise, for the notes tell us that children are not inventive, they are "just very good mimics and copiers". He was not alone in entertaining such an opinion; there is a similar statement in the introduction to Brown Girl. All I can ask is, if they didn't invent the stuff who did? Children mimic more than they originate, that is the way of tradition, but where inventiveness takes a hand is in how the stuff is reworked. If you doubt these words, let the record speak for itself. Some of this stuff is so bizarre it would do credit to a Goon Show script. The original release of this disc was covered for Musical Traditions by Tish Stubbs. A question she raised then seems even more pertinent now. Who, apart from the handful of us nuts who treasure the stuff, would buy it? Well, the heritage industry has come on in leaps and bounds since and there are now whole chains of shops dedicated to selling you the illusion of a past which never existed. Shrewd marketing men have realised that, in the right setting, recordings of genuine living tradition can be made to look part of that illusion. I can just picture this offering nestling between the Victorian cookbooks and Isle of Lewis chess sets.